I had never been much into professional massages. I felt that having a massage would be an exercise in futility since I would lose whatever relaxation I would feel with all the traffic, heat, pollution, and congestion when going home from the spa. So although there were tons of promos on massages, I never availed one. 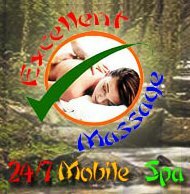 Until I saw Excellent Massage and Mobile Spa's promo in CashCashPinoy. Theirs was a home service massage, longer than most massage offers I had seen (you could choose either 90mins or 120mins) yet very affordable (P190 instead of P375 for the 90min massage and P250 instead of P500 for the 120min massage). Scheduling was flexible, since they operated 24/7 and the offer was valid anywhere in Metro Manila. I bought four vouchers - one for me, three for an elderly relative who had been complaining of muscle and joint aches. We had three appointments last month. Communication was good. On all three appointments, I got a text message several hours before, reminding me that I would be seeing their masseuse later that day. The masseuses were on time during the first and third appointments. On the second appointment, the masseuse was a bit late but I was informed beforehand by their office. On the first visit, a girl named Ivy was the masseuse. She was skinny and fragile-looking but she was able to give firm massages and did not even look exhausted after giving back-to-back 90min massages. She was also very shy. We had to force her to eat some snacks after the first massage. The following day, the shoulder area near the base of my neck was sore. I should have told Ivy to ease up on the pressure there. Do not commit the same mistake as I did. Be more vocal about your preferences, especially about pressure or body parts that you don't feel comfortable being touched by others. If you have injuries or other medical conditions, better let them know before or during the massage so that they could customize the massage for you. My relative had high blood pressure and pains on her upper arm, so Ivy did not massage her nape but gave more attention to the arm and to the shoulder in order to improve the flexibility and circulation in those areas. On the second appointment, the name of the masseuse was Annie and in the third, it was Kris. After three sessions, my relative was quite satisfied and claimed that the massages really helped in easing the discomfort she was feeling and she could now move her arm more. According to her, all three masseuses were also nice and polite. I'm a SPA-dict as I need to loosen some stiff muscles after a run or a bike ride. It really helps in speeding up recovery. wow half the price, that's a good deal! we always go to spa every weekend. i think i should search online for discount deals. Great deal! Too bad the succeeding promos didn't cover Caloocan anymore. My wife and I usually have massage in the comfort of our bedroom. We don't go to any spa parlor anymore...until we've found out her cousin is a professional masseuse and we are now her regular clients. my wife just bought her a therapeutic oil and she doesn't charge us anymore but since she's a relative we still give her tip and of course we let her stay home whenever she's in our area. Man ako very unlucky sa mga massage2. Siguro out of 10 only 3-4 were actually good at it. ._. Really? What made the other ones bad? never really experienced :) but i would love to! that was a great deal for a home service massage.I always get free massage from hubby though. I haven't experienced home service massage (if hilot doesn't count?). One time though, I got sick after a massage so I'm kinda weary just get one from somewhere I'm not aware of. From what I know, if your aim is relaxation, then you don't have to worry much. But if your goal is physical therapy, you really have to find a knowledgeable masseuse/masseur. I've heard that a bad massage can make you worse. In abroad, the massage therapists need to have a license compared to ordinary masseuses/masseurs. am well-educated, honest, sincere and like to keep things secret. I am looking for some Foreigner/ Local MALE customer to massage their full body & to give them relax. I DON’T have any shop. I will go to your hotel/ home, if u call me. My rate is cheap. You have to pay in U.S.Dollar OR equivalent Bangladesh Taka for FULL BODY MASSAGE. call me directly anytime at my cell no. 01926070271 (from Dhaka) OR +88 01926070271 (from abroad). If you come to Dhaka, you may call me from any land or cell phone. I will do MORE for you, if you need after full body massage. Take care…..
for only 1 day, call me directly at my cell so that I can go to your hotel room as early as possible. Sometimes home service is really good but there's a good chiropractor in sydney and I would love to visit that in time. It is really a Good Deal! I wanna try their service. Weekend means pampering! This could be new or it's just me but mobile spa is just clever. This is a must-try. Thanks for sharing! I need this right now. I didnt know we have this here in the metro. Tsk. This is cool. Di ko na kelangan maghanap ng spa, sila na pupunta sa bahay nyo. Hehehe. Great! Just be careful with your belongings, I heard some some people lose valuable items after a home service! it's a nice deal but i'm also worried on other deal site because many people have been telling that they are not true. love massages.. mahal lang dito! sa pinas mga bulag nagmamasahe sa min .. kamiss.. need massage now!!! My husband and I used to have a monthly schedule for body massage but now that I am pregnant we stop. Body massage and spa has a great relaxing effect in our body and mind. I've seen massages for pregnant women but I'm not so sure just how safe those are. I always wanted to try this service. But my husband didnt allow me. He just don't trust anybody in our house. Tsk tsk.. I can't blame your hubby. Just to be on the safe side, what we did was to put a mattress in the living room and have our massage there instead of in the bedroom. You and your hubby can also take turns - one watching over while the other one is getting a massage. Sounds really cool and very good deal. Normally, massage shops ask for a double pay for a home service sessions. Love massages, but I want to do it in our home. he wants the ambiance and air-conditioned rooms. But he should tag me along with him. LOL! Call for Body Massage by Man... Only for Ladies. Just mail me relaxmassage75@gmail.com.